Daring teams to think Wildly and work differently together. A highly customized and refreshingly different approach that draws out the best in your team. 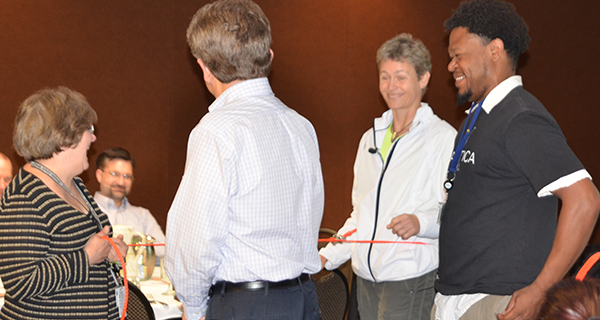 On- or off-site programs for teams, leaders, or whole organizations that need a boost of energy and fresh perspective in working together positively and whole-heartedly. Wild at work is never boring. We roll up our sleeves and dive into the specifics of what your team most needs, using sled dog or whitewater analogies to explore everyday challenges of working together. A blend of small group exercises, self-reflection, memorable stories, and Wild dares (created by the group) keeps people engaged and makes the experience vibrant and useful. Highlight and draw out the strengths and skills of each individual in your team. Deepen your team’s capacity to work together from a place of self-knowledge, compassionate presence, and courageous conversations. Request Info About Team Building / Training. Chris facilitated the first day of our retreat for 40 leaders. Her engaging storytelling and natural wisdom resonated with everyone. She challenged us to be authentic while leading change. Wild team trips are decidedly NOT stress/challenge programs. We figure your team already knows what it’s like to work together under stress. Why not try something different? What can a little bit of wilderness offer your team? 3. Focus on what your team needs most: shared mission/vision; invigoration and inspiration; improved communication; collaboration and relational skills…and have some fun along the way! Schedule an on- or off-site program.